As part of the investigative assistance provided by the FBI to the Las Vegas Metropolitan Police Department (LVMPD), FBI Las Vegas Division requested that the FBI Behavioral Analysis Unit (BAU) conduct a post-attack analysis of Paddock. The BAU was asked to examine the possible motives behind Paddock’s shooting and to identify Paddock’s pre-attack behaviors. In response to the request, the BAU convened a diverse group of experts from within and outside the FBI to form the Las Vegas Review Panel (LVRP). This multi-disciplinary panel was comprised of experts in threat assessment, psychology, psychiatry, research, cyber behavioral analysis, law, and child sexual exploitation. Members of the panel were selected based on their familiarity with targeted violence and behavioral analysis, but also with a deliberate intent to assemble varied perspectives crossing a spectrum of relevant subject areas. The LVRP spent nearly 12 months synthesizing and analyzing the vast amount of information and evidence gathered by the LVMPD and the FBI. 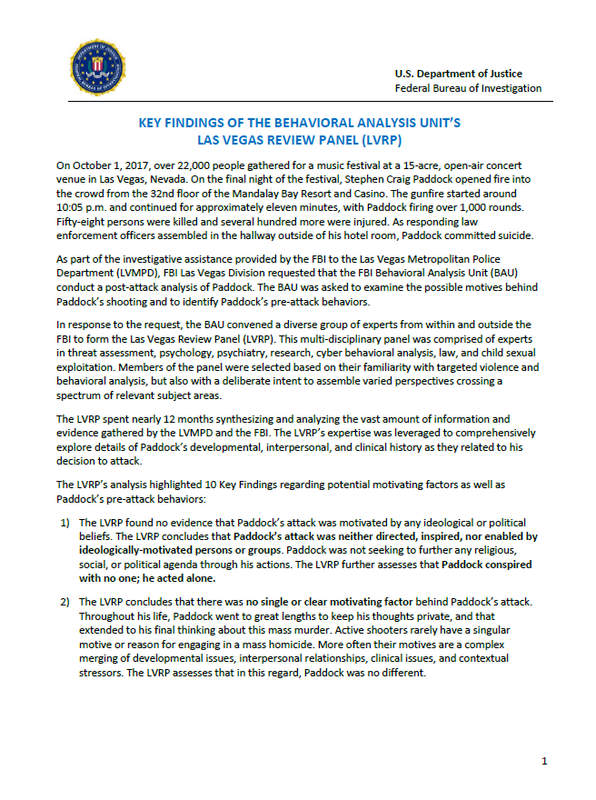 The LVRP’s expertise was leveraged to comprehensively explore details of Paddock’s developmental, interpersonal, and clinical history as they related to his decision to attack. 1) The LVRP found no evidence that Paddock’s attack was motivated by any ideological or political beliefs. The LVRP concludes that Paddock’s attack was neither directed, inspired, nor enabled by ideologically-motivated persons or groups. Paddock was not seeking to further any religious, social, or political agenda through his actions. The LVRP further assesses that Paddock conspired with no one; he acted alone. 2) The LVRP concludes that there was no single or clear motivating factor behind Paddock’s attack. Throughout his life, Paddock went to great lengths to keep his thoughts private, and that extended to his final thinking about this mass murder. Active shooters rarely have a singular motive or reason for engaging in a mass homicide. More often their motives are a complex merging of developmental issues, interpersonal relationships, clinical issues, and contextual stressors. The LVRP assesses that in this regard, Paddock was no different. 3) Investigators found no manifesto, video, suicide note, or other communication (hidden, encrypted, coded, or otherwise) relating to the planned attack or explaining his reason for attacking. However, an important aspect of the attack was Paddock’s desire to die by suicide. As he grew older, Paddock became increasingly distressed and intolerant of stimuli while simultaneously failing to navigate common life stressors affiliated with aging. The LVRP assesses that Paddock experienced an objective (and subjective) decline in physical and mental health, level of functioning, and financial status over the last several years of his life. In reaction to this decline, Paddock concluded that he would seek to control the ending of his life via a suicidal act. His inability or unwillingness to perceive any alternatives to this ending influenced his decision to attack. 4) The LVRP concludes that Paddock’s intention to die by suicide was compounded by his desire to attain a certain degree of infamy via a mass casualty attack. In this aspect, the LVRP believes that Paddock was influenced by the memory of his father, who was himself a well-known criminal. Paddock’s father created a façade to mask his true criminal identity and hide his diagnosed psychopathic history, and in so doing ultimately achieved significant criminal notoriety. 5) The LVRP assesses that Paddock displayed minimal empathy throughout his life and primarily viewed others through a transactional lens of costs and benefits. Paddock’s decision to murder people while they were being entertained was consistent with his personality. He had a history of exploiting others through manipulation and duplicity, sometimes resulting in a cruel deprivation of their expectations without warning. 6) Exhaustive investigations by the LVMPD and the FBI yielded no indication that Paddock’s attack was motivated by a grievance against any specific casino, hotel, or institution in Las Vegas; the Mandalay Bay Resort and Casino; the Route 91 Harvest Festival; or against anyone killed or injured during the attack. Paddock’s exploration of other potential sites suggests that his final selection was based on the identification of a tactically-advantageous location from which to attack. His selected position in a hotel room on the 32nd floor enabled Paddock to shoot at a densely-packed crowd of unsuspecting and vulnerable people. Further, it provided sufficient privacy for Paddock to prepare for and execute the attack, all within driving distance of his residence in Mesquite. 7) Throughout his life, Paddock displayed an ability to devote significant time, focused attention, and energy to specific hobbies or projects of interest. Once Paddock decided to attack, he characteristically devoted time, attention, and energy to the shooting. Paddock engaged in detailed preparations for the attack, including a year-long burst of firearms and ammunition acquisition. The planning and preparation – in and of itself – was likely satisfying to Paddock as it provided a sense of direction and control despite his mental and physical decline. He engaged in significant, methodical, Internet-based research regarding site selection, police tactics and response, and ballistics. Paddock conducted in-person site surveillance and engaged in end-of-life planning. Despite Paddock’s research, planning, and preparation, the LVRP found no evidence that he communicated his intent to commit an attack to others or that anyone was aware of his objective. This finding is consistent with Paddock’s personality and private nature. 8) There is no evidence that Paddock planned for or sought to escape the Mandalay Bay hotel room after the attack. Further, the LVRP assesses that Paddock took multiple, calculated steps to insure that he could commit suicide at a time and in a manner of his choosing. This included the use of surveillance cameras to alert Paddock to approaching police responders and his decision to bring one handgun (a .38 caliber revolver) which he used to commit suicide. The LVRP assesses that Paddock accelerated the timing of his attack on the Route 91 Harvest Festival based on his perception that a security/law enforcement response to his room was imminent. 9) Prior to the attack, Paddock maintained interpersonal relationships and was not completely isolated. He appeared to demonstrate authentic concern and responsibility for his girlfriend and certain family members while sustaining amicable relationships with previous intimate partners. Paddock’s declining mental and physical condition, stressors, and concerning behaviors in the years leading up to the attack were observed by others although not interpreted as indicative of preparation for a mass casualty attack. 10) The LVRP’s Key Findings illustrate that Paddock was, in many ways, similar to other active shooters the FBI has studied. Research conducted by the FBI indicates that active shooters typically experience an average of 3.6 stressors prior to an attack and display an average of 4.7 concerning behaviors to others. Additionally, 21% of active shooters studied by the FBI had no identifiable grievance or the grievance was unknown prior to their attack. More than half lived with someone else and 48% had suicidal ideation or engaged in suicide-related behaviors at some point prior to the attack.